Keto coffee in its purest form has three main components: coffee, grass-fed butter, and MCT oil. MCT oil is the fastest absorbed oil out there, helping keep you energized and satiated throughout your busy day. 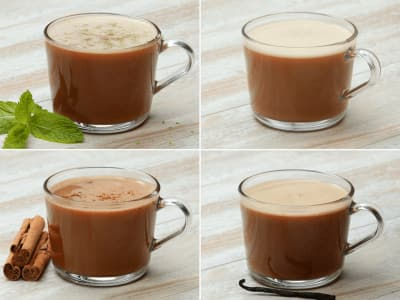 Here are four different ways to prepare Keto Coffee to keep your mornings exciting and delicious! You can add fresh mint, a vanilla bean, or even a blend of warm spices, including cinnamon, ginger, nutmeg and cloves. MCT oil is a highly concentrated source of medium-chain triglycerides. It is man-made, through a process called fractionation. This involves extracting and isolating the MCTs from coconut or palm kernel oil. MCT oil has benefits related to heart health, obesity prevention and brain health. Alternately, put the ingredients into a deep bowl or pot and blend with an immersion blender until smooth for the recipes that call for a blender. Per Serving: 486 calories; 51g fat; 6.7g carbohydrates; 3g protein; 61mg cholesterol; 224mg sodium. I can't function without coffee, but have been wanting something a bit healthier, high quality, and will keep me energized. This recipe was everything I expected and more. It has delicious taste and is very creamy. All of the flavors are great. Tried the vanilla keto coffee, it was really good. Glad to have found a recipe that uses MCT oil. Nicely done! This keto coffee is amazing! My favorite was the classic and chai. Honestly, they all taste great though! It's my new go to for the morning! The classic keto coffee is my morning go-to. I never thought about using my blender to make coffee, but glad I did because it saves me a ton of time in the morning. I made the vanilla keto coffee but used 1 teaspoon sugar-free vanilla extract instead of a vanilla bean. I had no idea I could make coffee in a blender, and now I'm hooked. Quick and convenient!